Today, I have been proof-reading the orchestral parts of my piece for the LSO, which means that it is as good as finished. Which means that I have roundly failed in my intention of diligently documenting the writing of it all last year. I was serious. I was going to blog my little heart out about the creative process, but it didn’t happen. There was too much going on. Besides the composition, there were workshops, discussions, meetings, concerts and all the other fascinating, energising stuff that comes with the Panufnik scheme. Plus having a slew of other projects on the go. Plus a day job. Blogging got sidelined. To make amends, or rather to ameliorate my guilty conscience, I am going to retrospectively share some of the process, with pictures. And other things. You must know this: I make notes. If I don’t write ideas down as soon as they come to me they’re gone and lost forever. So I fill up notebooks, PostIt notes, scraps of paper, and the FiloFax (yes, I have a FiloFax, because I am from the 1980s) with thoughts – a combination of project ideas, strategies and scraps of lyrics for songs. Obviously, 90% of this stuff never makes it into a finished piece, or a successfully realised project. I’ve come to think of these meanderings as “The Dreadful Notebooks”. In fact, one of the ideas from last year was a project with that very title, a kind of intellectual damage limitation exercise wherein I would just sing the contents of a notebook or two, in its entirety, cover to cover, live. Naturally, the first thing I did when thinking about what I’d write for the LSO was gather ideas in text form. For the last 10 years or so, I’ve worked in pop and electronic music, and on sound for gallery installations, so it’s been a while since I wrote anything for the orchestra. 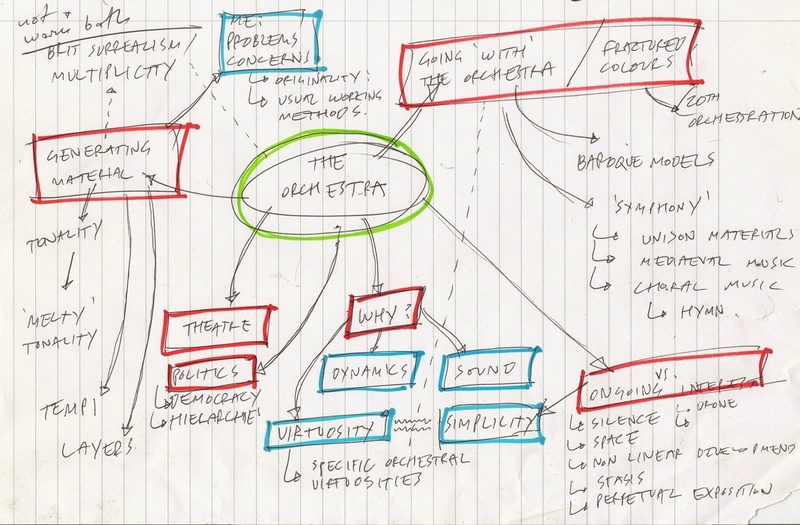 It felt important to consider why the orchestra is still an artistically powerful medium and how writing for it might fall within my own practice in a meaningful way. I didn’t refer back to this whilst writing, so it’s interesting to see how it now matches/doesn’t match the finished piece. These phrases jump out now: Simplicity – ‘Melty’ Tonality – Democracy [vs.] Hierarchies – Stasis – Hymn. I think these qualities probably remain in the finished thing. Certainly, I haven’t gone for anything showy. No flash. No orchestral fireworks. I see that I wrote Brit Surrealism. I really hope that quality ended up in the piece, somehow. Up at the top it also says Not a warm bath, whatever that means. There’s another page of notes for an initial, conceptual idea which I rejected sharpish, wherein the orchestra would play one long sound effect like a foley cue; the sound of a spaceship landing. I was thinking it would be a small tribute to the LSO’s illustrious history as superlative performers of some of the 20th century’s iconic film scores. It seemed a bit trite. Binned. This ended up generating everything in the piece. The scale falls over and over again, the colouring changes, but only once a phrase. Finally, in the very late stages of writing this piece, at the beginning of December, I saw an exhibition of pieces by the ‘Arte Povera’ artist Jannis Kounellis. I’ve always liked these particular artists for presenting familiar or simple objects or processes with a minimum of interference and maximum wit and meaning (I wrote some music many years ago which was based on ideas by another Arte Povera figure, Alighiero Boetti). It gave me a little confidence to not push my own, musical everyday object (the descending scale) around too much. In fact, I only intended to push it just enough to give it back some energy, or “put its teeth back in” as I thought of it. Perhaps that’s what I meant by not a warm bath. An orchestral object for the LSO needed a title reflecting the orchestra’s historical position, some elegance and a certain amount of weight. The piece is called Brown Leather Sofa. Anyway. It’s done. I’m now looking forward to hearing what everyone makes of it on the 11th April at LSO St. Lukes. I’m also very excited to hear what my fellow Panufnik scheme composers (Patrick Brennan, David Coonan, Bushra El-Turk, Ryan Latimer and Aaron Parker) have been up to. They’re a brilliant and talented bunch. The shipping forecast has started. The 2010 composers commenced their participation on the Panufnik Young Composers Scheme with a Reality Weekend in February. This included meeting James MacMillan (this year’s Guest Composition Director while Colin Matthews is on sabbatical) and Camilla Panufnik (Project Champion), as well as meeting LSO players to explore their instruments. The composers also had practical sessions on presentation and communication skills. The composers are now in the process of writing their pieces and will be meeting in June to catch up on progress. They are attending LSO rehearsals and concerts as well as regular tutorials with James MacMillan. The new pieces will be rehearsed in a public workshop on Friday 7 January 2011. In addition to the six composers writing a three-minute piece, Vlad Maistorovici, a participant on the 2009 scheme, is working on a 10 minute commission for the LSO which will be rehearsed and performed at an LSO concert at the Barbican. The 2009 composers commenced their participation on the Panufnik Young Composers Scheme with a Reality Weekend in January. This included meeting Colin Matthews (Composition Director), Camilla Panufnik (Project Champion), Lucy O’Rorke (Helen Hamlyn Trust) and Raymond Yiu (2008 Panufnik composer), as well as meeting LSO players (David Alberman, Patrick Harrild, Neil Percy and Bryn Lewis), to explore their instruments. The composers also had practical sessions on presentation and communication skills. The composers are now in the process of writing their pieces and will be meeting on 14 May to have a Gamelan session and to catch up on progress. They are attending LSO rehearsals and concerts as well as regular tutorials with Colin Matthews. The new pieces will be rehearsed in a public workshop on Monday 5 October 2009. In addition to the six composers writing a 3 minute piece, Andrew McCormack, a participant on the 2008 scheme, is working on a 10 minute commission for the LSO which will also be rehearsed on Monday 5 October before it is premiered with Francois-Xavier Roth and the LSO on Thursday 10 December 2009. Over the coming months our six Panufnik composers will be sharing their experiences of writing a piece for the LSO. The composers commenced their participation on the Panufnik Young Composers Scheme with a Reality Day! on 17 March. This included meeting Colin Matthews (Composition mentor), David Alberman (LSO Principal Second Violin), Camilla Panufnik (Project champion), Lucy O’Rorke (Helen Hamlyn Trust), and Emily Howard (2007 Panufnik composer) as well as practical sessions on presentation, PR and a photo shoot. The composers are now in the process of writing their pieces. They will be attending LSO rehearsals and concerts as well as regular tutorials with Colin Matthews. The six new pieces will be rehearsed in a public workshop on Friday 3 October 2008.